Recently two investment management companies, Betterment and Wealthfront, have gained an impressive amount of popularity. As you might already be aware, I'm quite skeptical of investment management firms as I've seen the dark side of the financial planning industry. Regardless, I wanted to research both offerings and compare the two in a "Betterment vs. Wealthfront" robo-advisor death match. I wanted to do this review mainly because I'm open to selecting one of these for my own personal use. Before we get into the details lets discuss the fundamental concepts that these services are based on. Despite what the investment industry will assure you (mutual and hedge fund managers, commission based financial advisers, stock brokers, etc. ), investment allocation decisions can be made solely using various mathematical models. Sure, in the investment allocation decision process you will need to identify risk preferences (subjective assessment), but those are quickly quantified for use in portfolio construction. All other required data (such as investment time horizon, retirement needs, age, current income, etc.) is numerical. With that said, a robo-advisor is a mathematical model that uses your data and individual circumstances to create a "personalized" portfolio. While a robo-advisor can eliminate the need for professional help to construct a long-term retirement portfolio, it will not satisfy the investment needs of everyone. If you require savvy arbitrage or hedging strategies in your portfolio then a robo-advisor is not for you. Additionally, you will not be able to choose what assets (stocks, funds, bonds, etc.) you invest in, the machine will do that for you. Betterment and Wealthfront are both robo-advisors and utilize mathematical models to automate asset allocation. 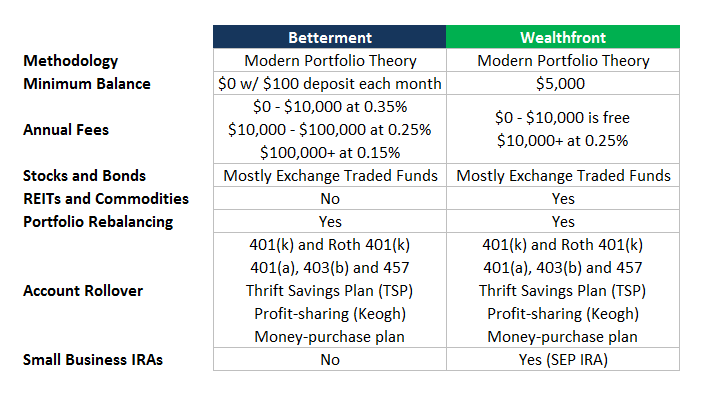 Both Betterment and Wealthfront are built on Modern Portfolio Theory (MPT) concepts. Harry Markowitz founded this theory with the understanding that portfolios can be constructed to maximize expected return based on a defined level of risk. Modern Portfolio Theory also suggests that efficient portfolios (optimized based on risk and return) can be constructed by varying allocations to asset classes (i.e. stocks and bonds). This leads to an emphasis on choosing the right blend of stocks, bonds and cash verses choosing one stock over the other. In addition to utilizing Modern Portfolio Theory to drive asset allocation decisions, Betterment and Wealthfront both take a passive approach to portfolio management. Eventhough they take a passive approach to investing, they will step in and rebalanced the portfolio as needed. Taking this approach keeps transaction costs and fees low. It's wise to take advantage of dollar cost averaging when using these service by setting up automatic investments. Now that we have a fundamental understanding of Modern Portfolio Theory and robo-advisors, it's time for Betterment vs. Wealthfront! When comparing these two services it is clear that they are both extremely similar. The only differences that will matter to the majority of main street investors is cost and initial deposit requirements. The advantages of choosing one over the other truly depends on your individual circumstances. If you are looking to start building a retirement portfolio from scratch, Betterment will allow you to open an account with no initial deposit. This is as long as you agree to automatically deposit $100 per month into your account. This is a huge advantage for those just starting out. However, the downside to starting out with Betterment is that their fees are higher for accounts under $10,000. I would personally take advantage of Betterment's low deposit requirement if I didn't have the $5,000 Wealthfront requires as an initial deposit. Additionally, I suspect if you have the $5,000 to use as an initial deposit when using Wealthfront, you won't stay in their "free" account status for long. I'm attracted to these services for the automatic allocation of investment funds. I'm a advocate of paycheck allotments used to contribute to investment accounts, however in practice it can become burdensome to manage. Thus paying a service like Betterment or Wealthfront to execute the transactions for me is a nice option to have. When developing a comprehensive financial plan, the retirement planning portion can be a little tricky. This is due to a few factors, the most critical being the assumptions that you have to make and the complexity of the calculations. About a year ago I downloaded Smart Money’s Retirement Planner App on my iPad. I was pleased with how intuitive the app made the retirement planning portion of a financial plan. I used it to determine how much money I can expect to have during retirement for my current savings rate. The purpose of a retirement plan is to help you understand how much money you will need to save and invest in-order to live the lifestyle you want during retirement. To accomplish this, your retirement plan needs to include a few key data elements. Demographic Information - Including the current age, expected retirement age and life expectancy of both you and your spouse is an important part of an retirement plan. This information helps determine how long you have until retirement and how long you are expected to be retired. Current Assets/ Salary - Including your current assets, salary and estimated future income enables the determination of how much money you will be able to save and invest before retirement. Expenses During Retirement - During retirement your expenses will most likely decrease, however it’s important to have an good estimate for how much money you will need during retirement. Social Security Income - Retirement plans need to include all sources of future income to include Social Security. Leading up to retirement, many will not be able to save enough to retire on. In this case, Social Security may end up being the main source of income during retirement. Planning Assumptions - Smart Money’s Retirement Planner includes all of the important assumptions including inflation, investment return, tax rate, income raises and life expectancy. I recommend using Smart Money’s Retirement Planner as it provides a simple and effective way to determine if and when you can afford to retire. It includes all of the critical data elements and provides a clear graphical representation of your retirement scenario. When you are building your retirement plan, remember to keep your income and earning assumptions towards the lower side and your expenses to the higher side. This will help to ensure that your retirement plan estimates are conservative. Planning for retirement is often seen as a daunting task. Using this free retirement planner will help you determine if and when you can afford to retire. When it comes to financial planning, most of us do not need fancy investments or expensive advisors. I have always believed that simplicity is the key to success, it's no different when managing your finances and planning for the future. These free financial services will help you improve your financial future. I’ve written about the Mint application before and my previous praise still stands. On mint.com you will find a powerful financial planning and management tool that will aggregate all of your financial information in one place. This allows you to get a clear snapshot of your personal finance at any given time. The software automatically pulls data from your bank, broker, retirement account and any other financial services that you use. Mint uses this data to track your income and expenses and provides alerts and advice depending on your situation. Lastly this program allows you to create a monthly budget and track your progress immediately. I highly recommend this financial planning tool. Smart Money’s Retirement Planner is a awesome tool that enables you to calculate your financial needs for retirement. For the most part the program is straight forward, however it’s not as intuitive as I would like. This retirement planner enables you to determine what your finances would look like under a variety of scenarios; this is also known as sensitivity and risk analysis. When using this application to help in the development of your retirement plan take a careful look at the pre-retirement savings rate, post-retirement spending, tax rate and inflation assumptions that you use. In financial planning it’s always a good idea to overestimate expenses and underestimate income. This ensures you develop conservative estimate. Over the past 20 years, banks have invested billions of dollars into their information technology systems. Despite the fact that there can be negative impacts to automating some banking and investment functions, there are a couple great capabilities worth mentioning. Direct Deposit- In addition to the previously mentioned apps, I’m also a huge fan of direct deposit. My advocation of direct deposit is due to the ability to create an automatic savings plan. By setting up a couple of different bank accounts you can easily save money by allocating a percentage of your paycheck to go to a “savings” only account. This way you never see or are tempted to spend your growing nest egg. Online Brokers- The shift to online investment brokers also has a few pros and cons. By setting up an online brokerage account you can easily transfer money to and from your bank account. Like direct deposit, you can also set up automatic investment transfers which could help you increase your savings and investment account without the headache of filling out a bunch of forms. I hope this article helps you develop a sound financial plan and improve your financial future. I personally use all of the financial planning tools listed here, so if you have any questions just leave them in the comments below.